TheNewRecord, a free music platform put together by a cadre of independent record labels went live today. Anti-, Kill Rock Stars, Sub Pop, Century Media, Daptone, and SideOne Dummy are among the 30+ labels involved in the new venture. The co-founder of SideOneDummy Records, Bill Armstrong, was also the creator. "As a fan, I felt that new music wasn't being organized in a way that made it easy to find....I wanted a filtered environment with what I consider other high quality artists whom we might share similar or even some of the same fans," he said. New label partners are being added. So what is TheNewRecord? Essentially, it's an electronic interface that allows users a free filtered environment to play and download new songs weeks in advance of release. With a free one-time sign-up, a user can play and download unlimited free MP3s, use a built-in widget to embed songs or playlists, create and swap customizable playlists with other users, and share new finds over Facebook, Twitter, email, or 340 other social networks. Using the "Follow" feature, users will have new music delivered to them directly from the record label or artist before release date. Users can also follow each other, filtering new music through their friend's tastes. Access to TheNewRecord will only be available in North America. The "classic line up" of Guided By Voices-Robert Pollard, Tobin Sprout, Mitch Mitchell, Greg Demos, Kevin Fennell with Jimmy Pollard-is releasing the first record of new material in 15 years shortly. Titled Let's Go Eat the Factory, the 21 new songs were recorded "in the living rooms, basements, and garages of various long-time band members." Some tracks were recorded more-or-less live at Mitch Mitchell's garage, where the band would often practice back in the early- and mid-90s. These sessions comprised Mitch, Bob, and Jimmy Pollard, Bob's brother and long-time collaborator, who, though never a part of the touring ensemble, always played a crucial role on the classic-era releases. Some tracks were improvised over acoustic jam sessions at Greg Demos' house. Many were recorded at Tobin Sprout's place in Wherever, Michigan, and later lovingly fucked with in order to achieve the proper level of weirdness. Band members switched instruments (e.g., Bob plays drums; Mitch plays drums; Jimmy Pollard plays bass; Greg plays lead guitar; Toby plays pretty much everything; etc. 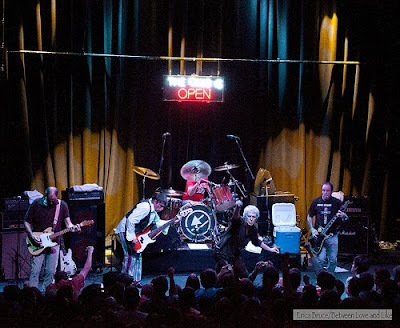 ), and Bob gladly accepted input from the rest of the band. Tobin Sprout wrote or co-wrote and sings on six out of the 21 songs. Let's Go Eat the Factory is slated for a 1/1/2012 release on the band's label, GBV Inc.
We covered the GBV classic lineup show at the 930 Club in October here. 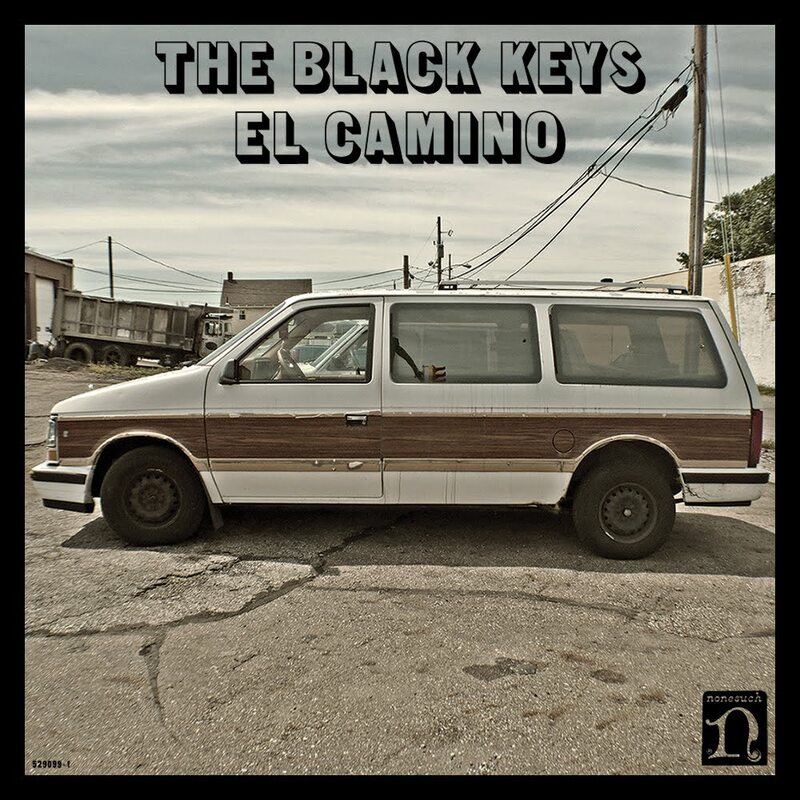 The Black Keys announced that El Camino, the follow up to Brothers, will drop on 12/6. Danger Mouse helped produce El Camino so one can only ponder of the interesting combination of sounds we will get. (Hot fact of the day: Danger Mouse produced their 2008 record Attack & Release as well.) The first single,“Lonely Boy,” will be released 10/26. 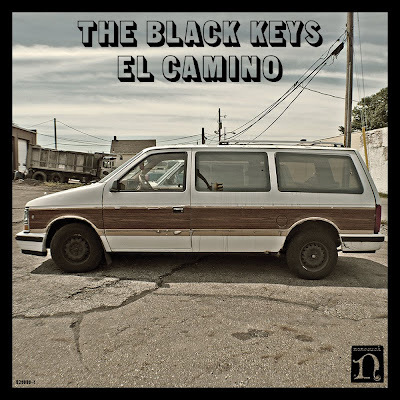 El Camino is the first Black Keys album that Nonesuch Records will release worldwide. The first time I saw A Place to Bury Strangers, I thought of that old Memorex print ad of a guy sitting in an easy chair, facing his stereo. His hair is blown back like the music coming from his stereo was so strong and clear it was like he was literally blown back. A three-piece from NYC, APTBS is like an indie-rock mashup of Motorhead and Pink Floyd playing through Phil Spector's "Wall of Sound;"unique but blistering loud, with a beat that's almost visceral. I've been enamored with A Place to Bury Strangers since I first heard their debut album. 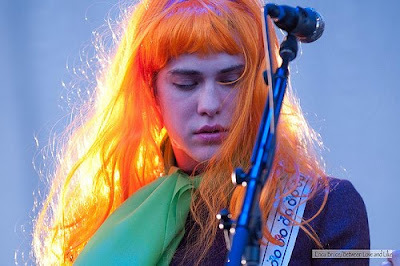 Their live shows have rattled me time and time again. It is not often you get to work with a band that you've been closely following for years, and we are honored to be a part of their new chapter. Wait until you hear what comes next. 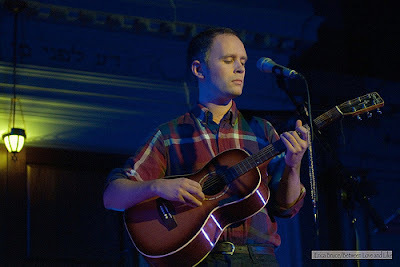 A new set of 5 songs, which will be released on Dead Oceans as an EP in early 2012 with tour dates in support. NYCers can also see them on 10/19 at the Dead Oceans/Strictly Canadian/ Jagjaguwar CMJ showcase in Brooklyn at the Union Pool. Don't forget your ear plugs. 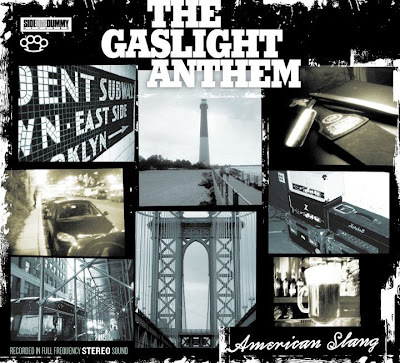 Gaslight Anthem announced today that they have moved labels, from Side One Dummy to Mercury Records. We're pleased to announce that we have just signed with Mercury Records (that's Mercury/Island-Def Jam Records for North America and Mercury Records UK for the rest of the world). We have had a great run with the folks at Side One Dummy Records, they have been really terrific to work with, and they will always be our dear friends. We in the band felt that this was the best time to make a move to ...support our goals as a band, and we've met some really earnest and dedicated folks at Mercury US and UK. We're hard at work writing songs now for what we feel is going to be the best record we've ever made! 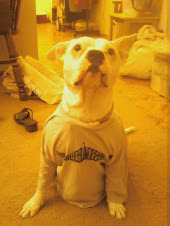 Thanks to everyone for your support and we look forward to seeing you in 2012! 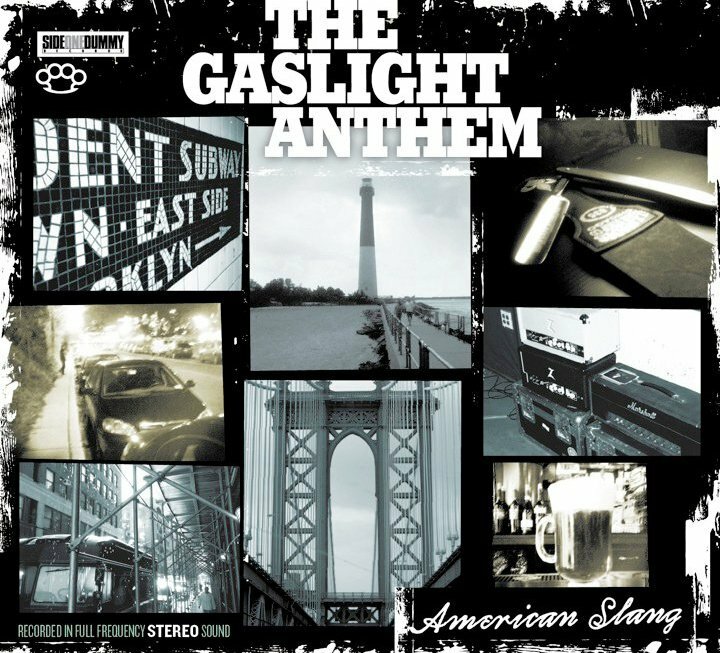 Gaslight will release its iTunes Session of four covers, "The Who, Pearl Jam, The Animals and Tom Petty, along with one track that we have never put on a record before called “Our Fathers Sons” and a new version of “Boxer,"" on 12/13. Singer/songwriter Jens Lekman may, at first listen, seem like a strange Swede. His songs, like "I Broke Up a Fight" and "Waiting for Kirsten," a song about waiting to see Kirsten Dunst at her hotel in his hometown, seem, well, odd. Lekman's songs initially appear as silly musical stories about nothing. But then he brings out a line that just nails how it feels when go through one of the deep situations we all endure at some point while on this mortal coil, and your perception is immediately changed. Lekman covers them all, heartache/hope/love/longing, and in the end, be it from his silly stories or his perfectly capturing the human emotion in verse, you don't feel serious or melancholy, you feel uplifted . My Washington City Paper piece will be up here later today. See more photos from the set here. Well how hip is the Guggenheim Museum in NYC these days? Seems they have booked none other than MGMT for two dates, one as the 2011 Guggenheim International Gala After-Party band on (11/10), and the other for the next night, 11/11 for the general public. Museum members will have a presale on 10/13 and 10/14, with member pre-sale codes announced via e-mail on 10/13. "More details to be announced soon," says the info page. They even include a contact email and phone number there as well. I hope they warned the little old lady volunteer manning the phones before posting this, because you just KNOW the ton of calls she will be getting once this goes really public. Shooting for the WCP has me hopping lately so I've been remiss in doing the double post over to here as well. But I had the great pleasure last night of shooting the swelligant vision that is Bryan Ferry. Admittedly, I was rather nervous-when shooting an icon, you don't want to mess it up and you want the shots to be beautiful. 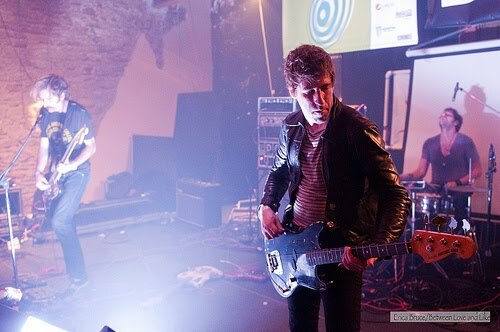 The trouble with Ferry's set last night is that he seemed to dislike being in a spotlight. Every other band member-guitar player, go-go girls (of course he had go-go girls, he's Bryan Ferry), saxophonist, backup singers-they all had spotlights. But not Ferry. According to a member of his crew, that was Ferry's decision, something they had been trying to get him away from for years now. 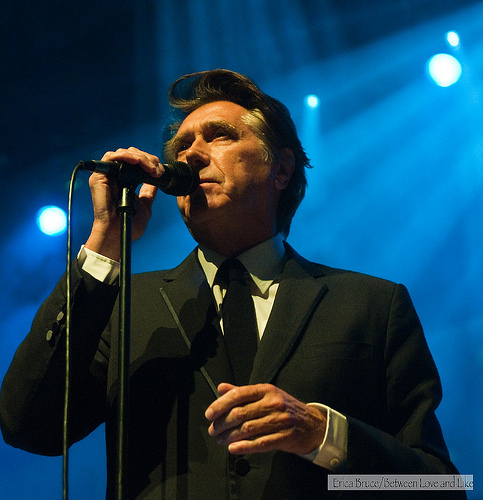 A true shame because Bryan Ferry has forever been a crooner of cool and sultan of style. At 66, the man is still in great shape physically and vocally. His cover of Dylan's "Make You Feel My Love" will stop you in your tracks. See the WCP piece here and the rest of the photos from the set here.